As some of you will know, it was my birthday on Saturday, so I thought I would share with you a few of the items I got as presents. Now by no means am I bragging or showing off, I purely wanted to share with you the items I got as I thought it would be a nice refreshing change on the blog and something a little different! This year there wan’t really anything that I wanted in particular, so I didn’t ask for anything from anyone, and instead I was given money to spend on a shopping trip to Manchester at the weekend! Top row: Vintage Dress from COW Manchester, Socks from Topshop, Mink Pink Dress from Urban Outfitters, Boots from Topshop. 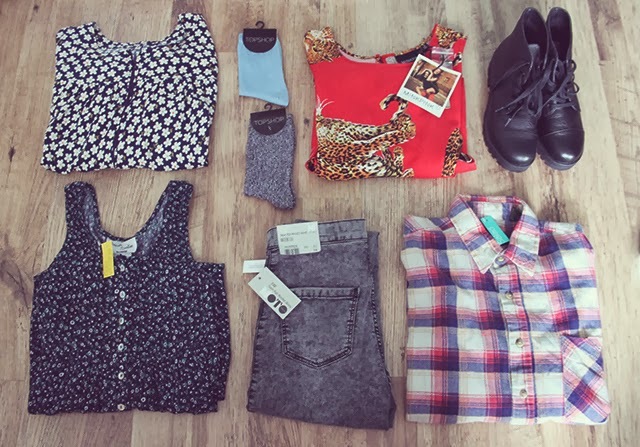 Bottom row: Vintage Dress from COW, Joni Jeans from Topshop, Vintage Check Shirt from Cow. 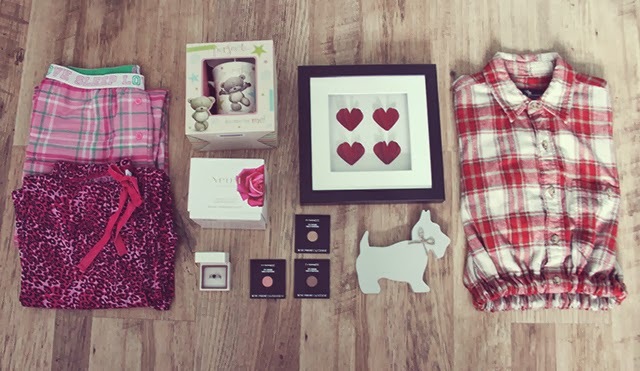 Clockwise from left: Pyjama bottoms from George, Teddy bear mug, Framed heart origami from John Lewis, Vintage cropped shirt from COW, Wooden westie cut out, MAC Eyeshadows in Amber Lights, Sable and Paradisco, Rings from Pandora, Neom Candle from John Lewis. Dan treated my like a princess and bought me the gorgeous Neom candle, origami heart frame and two Pandora rings, and also gave me some money to spend whilst we were out and about, before treating me to a yummy meal at Southern Eleven in Manchester. If you haven’t been, then you HAVE to try it! It’s located in Spinningfields and has the most gorgeous menu of Southern American style food. We had their pulled pork and mini burgers to share, as well as yummy cocktails. So that’s what I got for my birthday this year. I felt very overwhelmed and super happy with everything I got as gifts and all the pieces I picked up in Manchester. I can’t believe it’s already over for another year! You lucky girl! Hope you had a lovely birthday! Love all the bits and pieces. You got some amazing bits so jel!